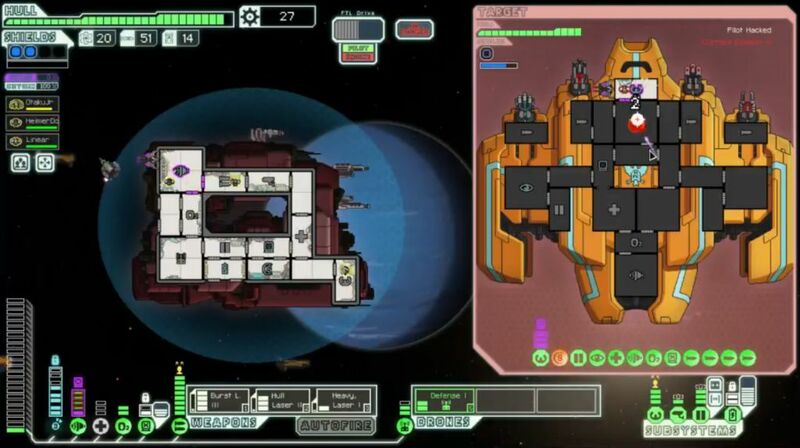 What makes a ship strong or weak in FTL? Broadly speaking, I would argue that they can be evaluated in three different categories: offense, defense, and crew. 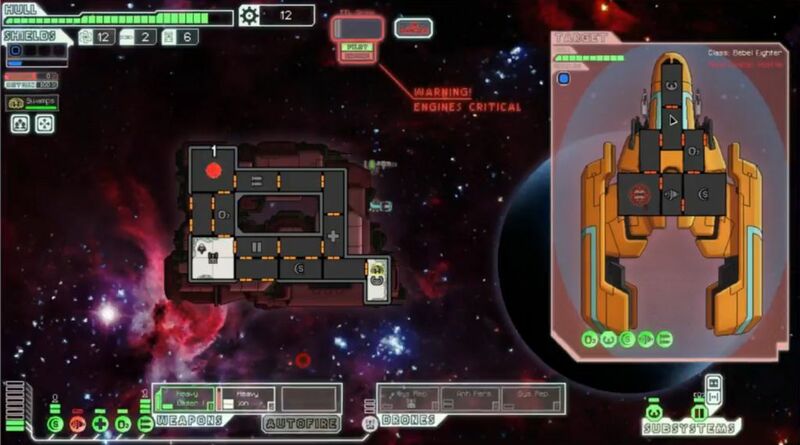 A ship's offensive performance obviously includes its starting weaponry, but also takes into account the presence of systems like the Teleporter/Hacking/Mind Control, any Combat Drones or Beam Drones used for attacking, offensive augments, whether the ship has 3 or 4 slots for weapons, and so on. The defensive side of things includes starting shields and engines, along with defensive drones (Defense Drone, Antidrone, Shield drone, etc. ), the presence of a Zoltan Shield or any other protective augments, Cloaking (the only completely defensive non-standard system), whether the ship begins with upgraded Doors or Piloting, and everything else of that nature. Crew is the easiest to understand, simply an accounting of the starting crew, but not to be underestimated. It's not just that extra crew members are useful for repairing damaged systems and fighting off invading marines. They also provide extremely useful passive benefits from operating systems. Someone standing in the Engine room provides 5% extra dodge chance just be being there - that's a free level of engines, without needing reactor power. When fully upgraded, that guy is worth 10% dodge chance, or two engine levels. The benefit is also substantial for weapons (10-20% faster charge time), and of course your ship won't fly at all without a pilot. 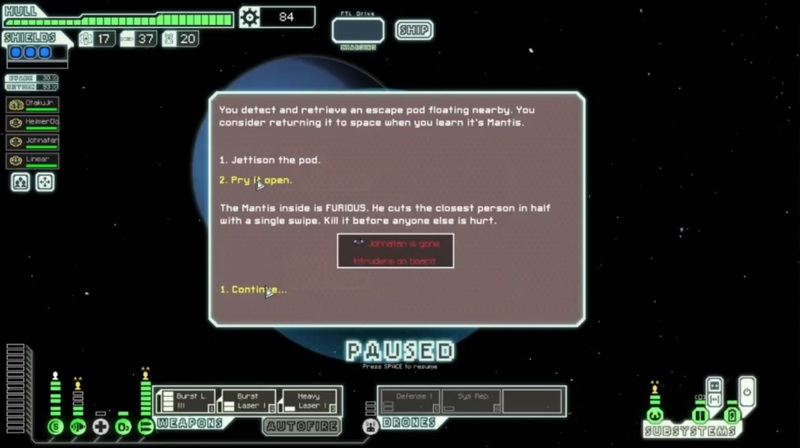 Anything less than 3 crew makes it very difficult to run a ship in FTL. I'd argue that this category is almost as important as a ship's offensive and defensive capabilities when thinking about its relative performance. The Heavy Laser and the Heavy Ion also make for terrible partners. Their chargeup times do not sync at all, with the Heavy Laser (9 seconds) forced to wait around for the Heavy Ion (13 seconds) with nearly every volley. 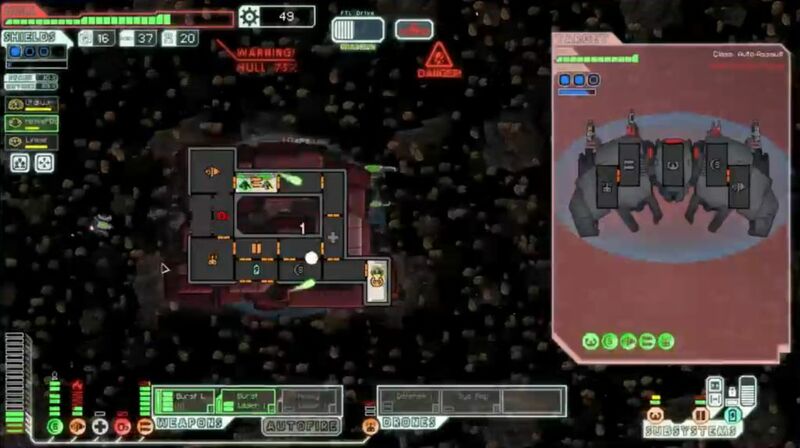 Most enemy ships at the start of the game will have one shield bubble, making the Heavy Laser useless without the other weapon. The Heavy Ion must go first and remove the shields, then the Heavy Laser can fire and deal damage. The crippling weakness: if EITHER of the two shots misses, you deal no damage and have to wait for the full weapon cooldown to try again. 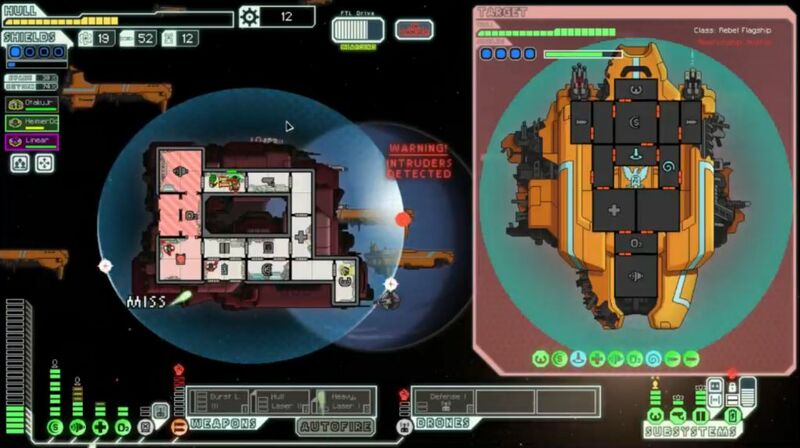 Meanwhile, the much stronger enemy ship will be firing away and pounding the poor Engi B. You can lose an entire run on the first jump if you get a streak of unlucky misses with either the laser or the ion. This is one of the worst starting setups for weapons in the entire game. 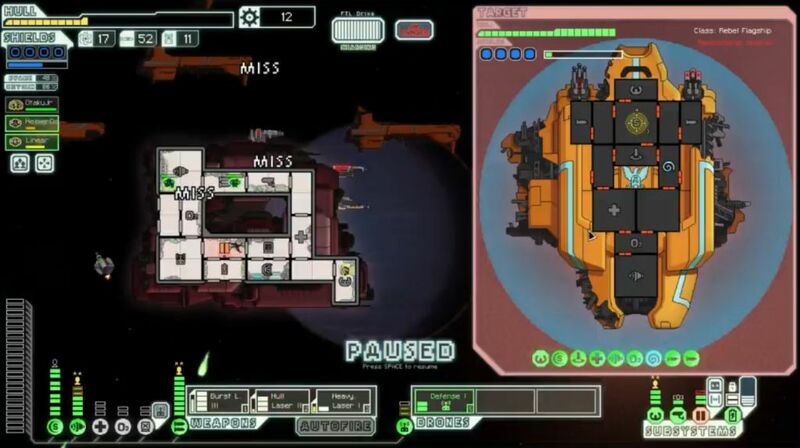 Still, all of this is just the buildup to the Engi B's most crippling weakness: You start the game with only ONE crew! This is the only ship in the game that functions this way. The default for most ships is 3 crew, some have 4 shipmates, and only a handful begin with just 2 people on board. But no others have a single Engi and nothing else. Your poor starting Engi is needed to pilot the ship, which leaves no one to man any of the other systems. Lacking the passive bonuses from the normal crew in engines, weapons, etc. is a giant handicap. The combination of level 1 engines and zero additional crew gives this ship a pitiful 10% evasion rate. Have fun dealing with those enemy missiles! Furthermore, when your systems take damage or invaders beam over to your ship, the Engi has to go deal with them, leaving no one to pilot the ship. Once the little cyborg steps out of the piloting room, all evade drops to 0%. No level 2 Piloting for you! Oh, and have I mentioned that the Doors do not start out upgraded, plus there are no Sensors to see attackers/fires on the ship? What a sweet deal! Now the Engi B does get two System Repair drones and an Antipersonnel drone to help out, and they are very much needed for repairing and fighting, respectively. Unfortunately you can't control either of them, and it's maddening to watch the System Repair drone off fixing something unimportant while the shields are burning down. Even with the Antipersonnel drone, it's still pretty tough to deal with boarders. Plus, you start the game with a whopping 6 drone parts - better not waste them! At least you get the thoroughly useless Drone Reactor Booster augment, so your crappy drones move around the ship 25% faster. Ummm, thanks. Thanks a lot. Overall then, Engi B sits at the absolute bottom of the FTL tier list, together with the Zoltan C. Based on my experience, I strongly believe that they are the two worst ships in the game. The number of things that can go wrong at the beginning of an Engi B run is almost too high to count. 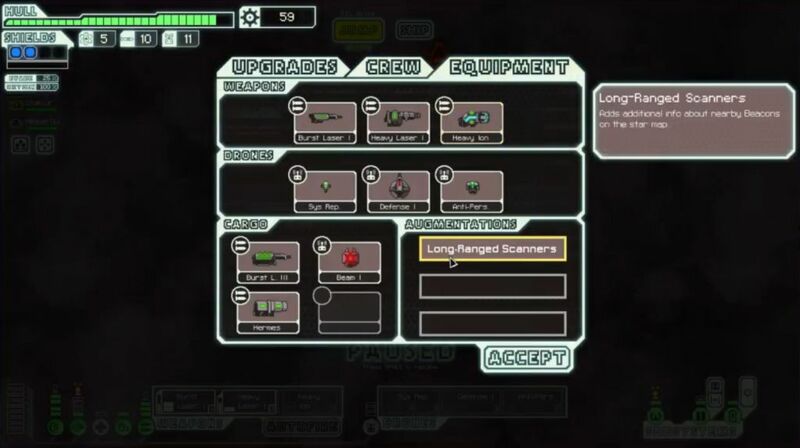 You desperately need to upgrade weapons, defenses, AND hire more crew, all at the same time. Winning on Hard difficulty requires great skill or a phenomenal amount of good luck. I honestly think the developers were trolling the player base when they drew up the Engi B. Do not use this ship unless you know exactly what you're doing, or you want to face one heck of a challenge. I had won a game with the Engi B offstream a while ago, largely because the ship annoyed me and I wanted to achieve a victory over this stupid setup. It wasn't easy though, and I lost quite a few runs before finally getting things to line up correctly. Winning on stream proved to be no picnic either. I lost the first three attempts withough making it too far. The fourth attempt had completely ludicrous good luck, finding all sorts of weapons completely for free, and it should have been a guaranteed triumph. Instead, I was unable to finding a Cloaking unit in the endgame, and lost at the very end of the flagship's third phase, largely because I foolishly had put my Halberd Beam in slot #3 instead of slot #1. I don't know what I was thinking there... The fifth attempt was another routine loss, simply unable to get over the dreaded curve before a nasty ship finished off the Engi B. The Engi pilot manned up in a huge way and landed the dodge at 10% evade. Note that the missile was aimed at the weapons room, which would have knocked the Heavy Ion offline, meaning the Engi B would deal no damage until repaired, and all the while the missile launcher on the rebel ship would be firing away... Ugh. That could have been a nasty damage cascade there. Even these basic early game encounters can be life and death for this ship. 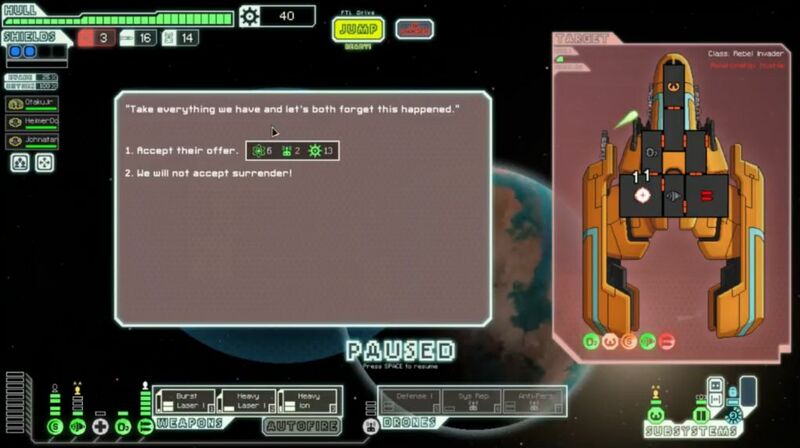 Then as a reward for winning, the civilian ship healed up 5 points of damage and opened up a store. There were no weapons for sale, but there was a Defensive Drone. Awesome! I sold one of the two System Repair Drones (one seems to be plenty) and the thoroughly useless Drone Reactor Booster, trading them for the Defensive Drone. Remember, the Engi B starts the game with pitiful evade, making a Defensive Drone even better than normal for blocking missiles. This was the kind of good fortune I needed to get off the ground with this terrible ship. Ummm, help? 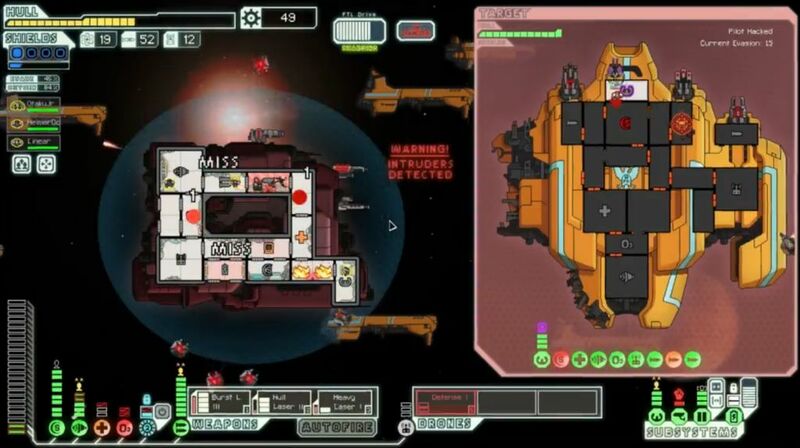 I had no defense against their weapons, no shields and zero evade without the Engi in the piloting room. And yet I had no choice; this was a lost battle unless I ran into that shield room and fixed them IMMEDIATELY. Can't wait for that slow Repair Drone to waddle over and deal with the problem. I've seen other people open up every door and empty the Engi B of oxygen, leaving only the piloting room supplied with air. Yes, that does help protect against boarders and fires, but I still don't recommend that because it traps your Engi at the helm, unable to go fix damaged systems. 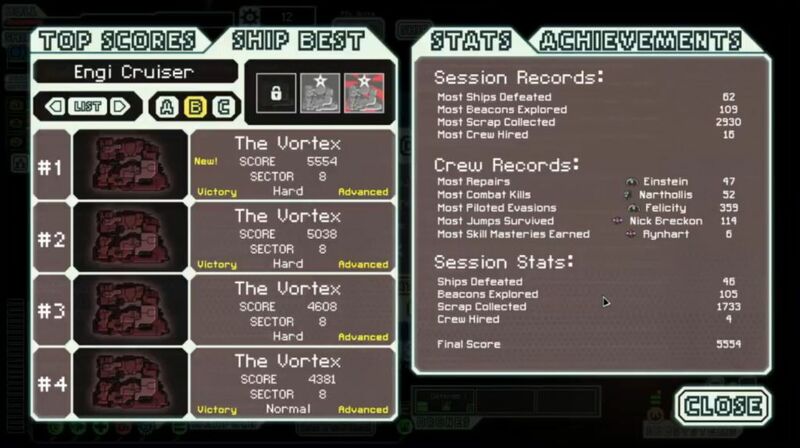 I was very willing on this run to send off the Engi to fix stuff when it had to be fixed right away. (How much does 10% evade even help, really? I know I got the godly dodge earlier, but come on.) Anyway, one hit to the weapons room here and I was cooked. Thankfully, the weapons room remained untouched for the precious seconds I needed to repair the shields (even as the Door room was smashed to pieces and multiple fires set elsewhere in the hull). The next Heavy Ion + Heavy Laser combo both hit, and I was able to knock their Beam Drone offline. From there I was able to stabilize and eventually take a nice surrender offer, but the damage already had been done. Twelve points of damage taken from this one battle, and I was lucky it wasn't twenty. Just slightly worse RNG luck and this could have been a lost run right here. Have I mentioned we're still not even halfway through Sector One yet? The very next battle was in an asteroid field, against a pirate ship with a two shot laser and a minibeam. The first volley hit my weapons room and set it on fire before I could even get off a shot. At this point, the asteroid field became my saving grace, as I could still deal damage with the Heavy Laser when an asteroid took out their shield bubble. 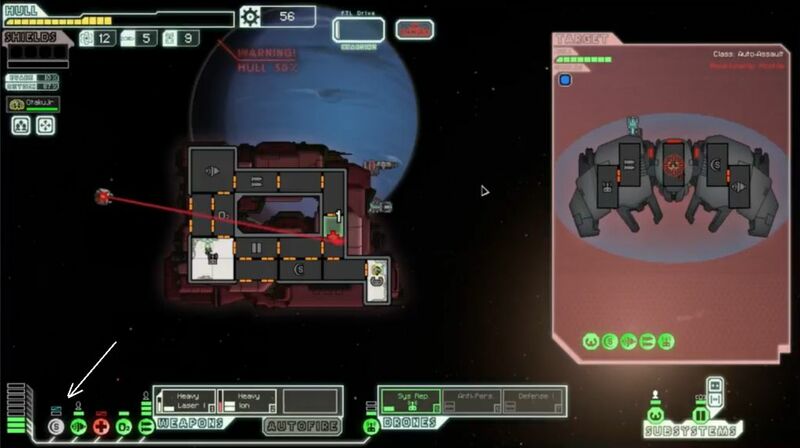 (ALWAYS put your Heavy Laser in slot #1 with Engi B! The game starts out the weapons in the opposite configuration.) My first Heavy shot successfully hit, and then I only had to deal with the Minibeam, which was blocked by shields. Whew. Another potential disaster narrowly avoided. I think this might well have been another run-killer without that first Heavy shot getting through. It's not like I could even run away from these encounters, not with level 1 Engines. You can't do anything about those pre-battle events. There would be no way to get shields back online for this battle. 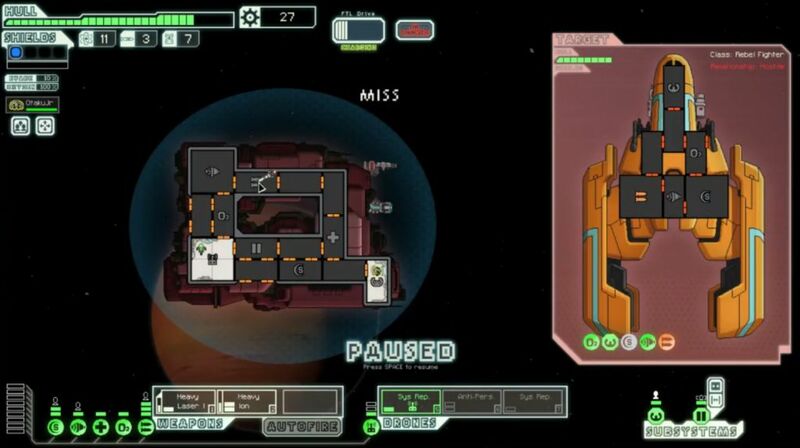 I had to pray that the Beam Drone wouldn't hit my weapons (fortunately it went after the Medbay), then that my first volley of shots would both hit. Once again, the Heavy Ion and Heavy Laser both flew true and landed on the enemy auto scout. I made sure to fire at the Drone Control system, not their weapons, as their only weapon was an Ion Blast that posed no threat at all. (That was also pretty lucky; that could have been a Heavy Laser just as easily.) Once again, I dodged an incredibly dangerous situation and eventually won the battle. Another 16 scrap earned, down to 12 remaining hull points. A gigantic break of good fortune landed at the next beacon, where I drew the slaver event and picked up a free Human crewmember when the pirates offered up a surrender. Having another warm body on board was simply enormous: an extra 5% evade even before gaining any engineer experience, someone else to repair the hull, fight off attackers, and so on. If nothing else, I was no longer in a position to lose the run from a single bad event (one that costs you a crewmember) hitting at the wrong time. The last couple battles of the sector came against more ships with missiles, which were no problem thanks to that early Defensive drone. I grabbed more scrap, and even found a Shield Drone for free. That would sell for 30 scrap in a store later. At this point, I finally reached the exit beacon, putting a close to one of the more eventful first sectors I can recall in a long time. The humble Burst I Laser wasn't flashy, but it was worlds better than that awful Heavy Ion. Now I could fire two normal laser shots (on a faster cooldown, and with the chance to deal damage and set fires!) then follow them up with the Heavy Laser after that. It was a vastly superior weapon setup, even for something so basic in nature. As if that wasn't enough, the store also had Long Ranger Scanners, the best augment in the game. From here on, I'd be able to plot a course for encounter after encounter, raising my scrap income substantially. I haven't seen the scanners in too many of my games recently, and it was very nice having them on board once again. I used the money I had left over for the Backup Battery and a full hull repair. Now this run was really cooking, with decent weapons + a defensive drone + Long Range Scanners. If I could find some more crew, I'd be almost as strong as the Kestrel B at the start of the game! Low fuel was actually one of my biggest concerns at this point. Despite fighting a large number of enemy ships, I simply was not getting much in the way of fuel drops. That's one of the more annoying random aspects of FTL, where sometimes you'll have way more fuel than you ever need and other times be forced to scramble like mad, while playing the game identically each time. Just another resource to juggle, I suppose. The enemy ships noticeably ramped up in difficulty at the start of Sector Three. 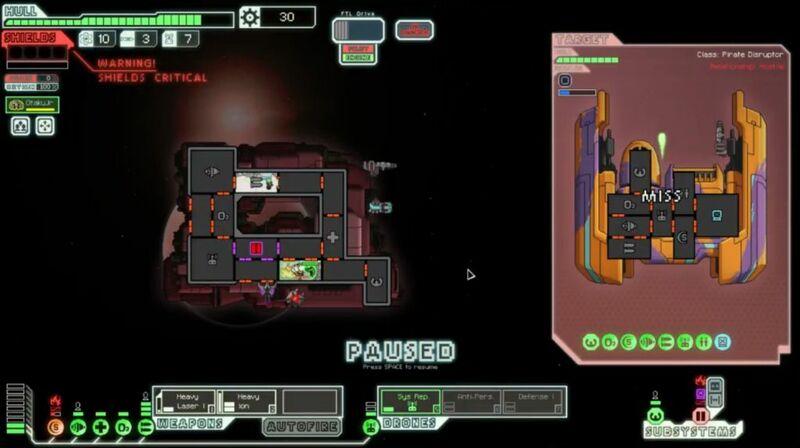 The very first opponent had a Burst III Laser, Basic Laser, Mind Control (fun when you have only a pair of crewmembers! ), two shield bubbles, and a Zoltan Shield. Only an insane flurry of dodges from our Engi pilot (four in a row at 40% odds!) and a nice first volley of laser shots managed to stave off serious trouble. Good thing I paused to train up the piloting/engines skill in that last sector. I was sitting on 1 fuel after this battle, and desperately hoping to find a store to load up on more. Fortunately I did find one a little later, picking up the maximum available 5 fuel and a new Human crewmember for 45 scrap. Now we had someone to run the weapons room, and a little more insurance against disaster. 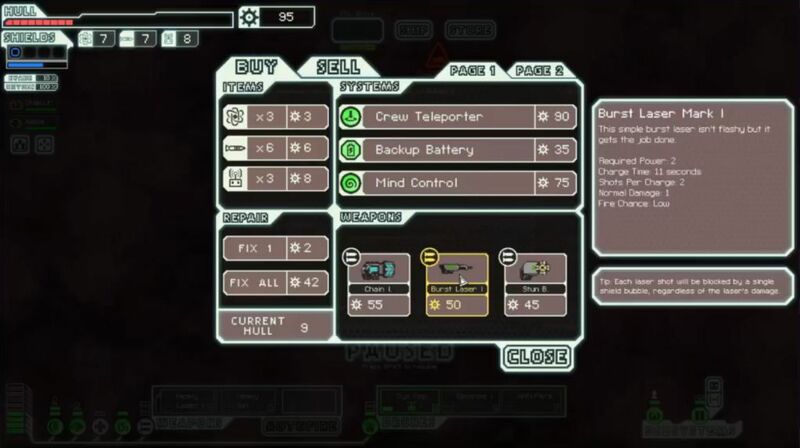 Normally I advise against purchasing crew in the early game, but the Engi B demonstrates the exception to the rule. We needed more humanoid lifeforms on board. There were no new weapons for sale worth purchasing, so I upgraded the Engi B's weapons to level 5 and pulled out the crummy Heavy Ion from storage. Weak as it was, the thing still did remove a single shield layer when it hit and helped make the fights significantly easier for the moment. We picked up a fourth crewmember, another Human, in a blue event while passing through Sector Four. It was almost starting to get crowded on the Engi B. I saved scrap through the rest of the sector, only to find no weapons for sale in the next store. I had 280 scrap and nothing to buy! Instead, I upgraded shields to level 6 for the third bubble, and weapons to level 7, bringing the Burst III Laser out of the cargo bay. Lacking any options to purchase better offensive tools, I was going to have to rely on that thing, since pretty much every enemy ship from this point forward would be sporting three shield layers itself. Now I just needed enough reactor power upgrades to run all of those new goodies... Farming up that scrap would occupy the Engi B for the next few encounters. I dove past the exit to fight two more battles, and then managed to scrape past the rebel fleet without taking any damage. A very nice sector indeed. Burst II Laser, dual Heavy Lasers, Minibeam, Combat Drone, three shield bubbles, high evade, and fought in an asteroid field. Are you kidding me?! That thing was a monster! From an offensive perspective, that auto scout was significantly more dangerous than the rebel flagship, and no, that's no exaggeration. (It would die much easier, of course.) I knew right away that I could not fight this terror and had to run away ASAP. The problem was that my engine room was hit by one of the many enemy lasers and set on fire. Damaged engines cause your FTL gauge to fill more slowly, and the fires threatened to burn out the system completely. I had barely any crew on hand to fix the Engi B's systems as they began to collapse around me, and this run was in mortal peril of coming to a very rapid end. I never managed to stabilize the situation, but I did manage to keep the engines alive long enough to jump away. Whew. Not before taking almost 20 hull damage though, driving the ship down into the danger zone. Why can't anything ever be easy for the Engi B??? I dropped as low as 4 HP when the Defensive drone failed to shoot down a series of missiles, but I did find a store in the back corner of Sector Five just in the nick of time. This one had Cloaking, Hacking, and extra crew for sale, pretty much everything I wanted. However, since I absolutely had to heal the ship or face imminent death, I was only able to pick up Hacking and nothing else. That would prove to be a fateful decision as the run played out later on. Hacking itself was a dream fit for my laser-heavy setup, and if I could only add Cloaking for defense and a few more humanoid beings to help operate the ship, this would be an easy win. A big if, as it turned out. I had the money I needed, and the game refused to give me the chance to spend it on what I truly needed! So frustrating. 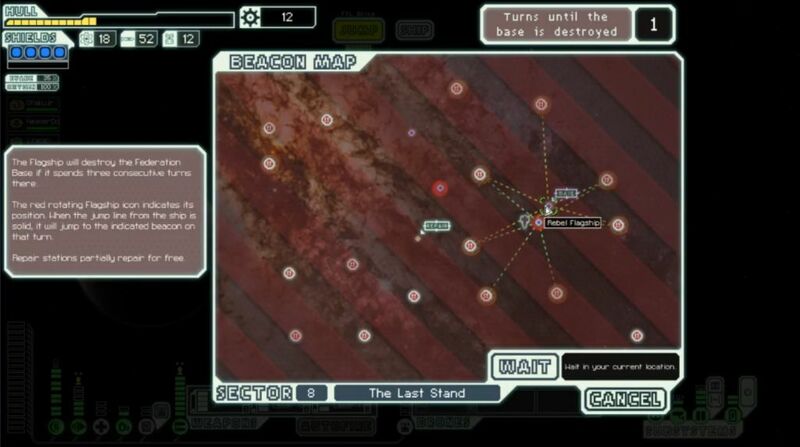 Any hope that I could find the one store in Sector Eight before it was taken over by the rebels was quickly dashed. There would be no last minute purchases to salvage this situation. Eventually I dumped that money into level 8 shields, level 6 engines, and the usual upgrades to damage buffer the other key systems. There was nothing else to spend it on! Did I have enough here to defeat the flagship? Maybe. 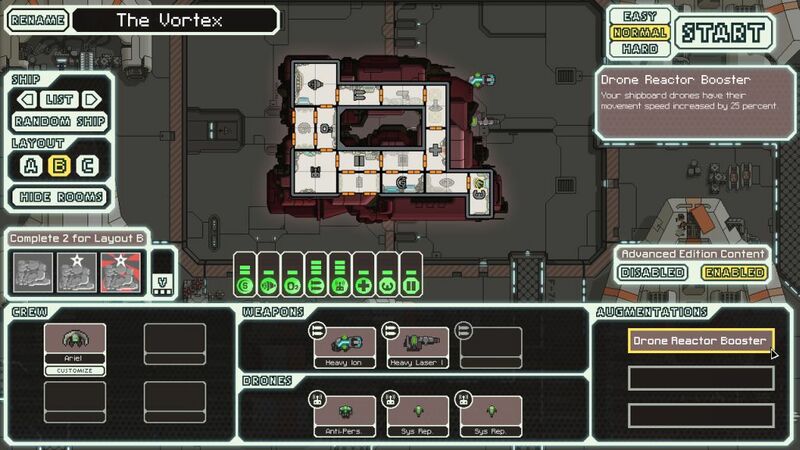 Weapons were no issue; with this offensive setup and Hacking, I could kill the flagship with ease. However, I had no Cloaking to dodge the flagship's missile swarm and drone + laser superweapons in the final two phases. To make matters worse, I still had only 3 crew manning the entire ship. What was I going to do against Boarding drones? More importantly, what was I going to do in the last phase of the flagship duel, when one of my three guys would be Mind Controlled and as many as six or seven enemy marines would start teleporting over to the ship? I had no answer to that question. All I could do was max out Piloting, Doors, and the Medbay at level 3 (one higher than I normally go) and hope for the best. I wasn't too worried about the first phase of the flagship. Engines getting hacked was unfortunate, although nowhere near as bad as having the hacking drone hit shields or weapons. My first offensive volley landed perfectly, aided by my own Hacking of course, dealing 6 hull damage and system damage to the rebel shield unit. Without scanners I couldn't tell exactly what was going on in there, but I knew they were hurting pretty badly. The second volley took out their shields completely, and hopefully killed some of the rebel crew. There was an unlucky timing near the end of the battle where they fired the missile swarm while also using Hacking for 0% evade; I pulled power out of the Heavy Laser to run the Defensive drone and shoot one of the three missiles down. This phase ended with 5 hull damage taken. Good, not great. Tons of damage on all sides. The rebels had managed to land the second Boarding drone as well, though fortunately it went into the Sensors room. I had no crew to spare to fight the thing, so I simply let it kill the useless sensors and accepted the point of hull damage. Bad news: the thing headed into the Weapons room next. Uh oh. There were also quite a few fires burning through the ship from the earlier drone surge. But our own lasers had taken out the flagship's missile weapon once their shields were down, and the rebel ship was rapidly losing health. It exploded for the second time just as the drone surge was about to unload again on the Engi B. That... that was too close. With the Engi pilot off fighting fires and the Human engineer fighting the Boarding drone, my ship had all of 12% evade for defense. I do not think that would have ended well. After repairing the system damage, the Engi B had 15 hull points remaining. Was that going to be enough for the final phase? With no Cloaking? 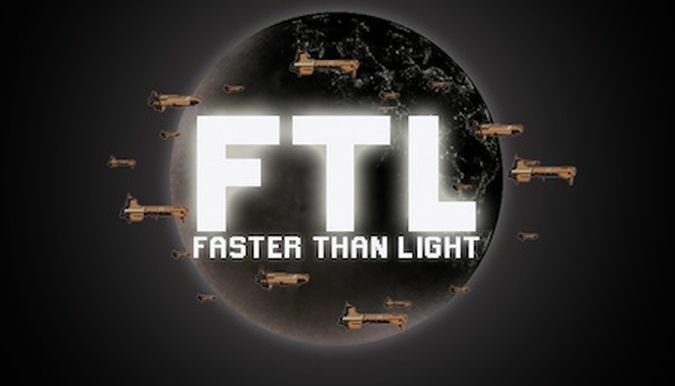 Based on my experience with FTL, I didn't think so. I was terrified of this last phase, with its Mind Control and use of the Teleporter. Three crew - one of them an Engi! - simply are not enough to deal with that threat. I expected that I would have to pull a retreating tactic to deal with the boarders, and that would cost me further hull points of damage taken. Still, I had to try. Here went nothing. The third phase began with the weapons Human getting Mind Controlled. While that was better than having the Engi pilot get hit, it wasn't exactly a good thing, especially when the crazed man immediately began damaging the weapon controls. I had to pull the Human engineer over to occupy him, and that removed 10% dodge chance from the ship. Then the rebel marines began teleporting over, one of them directly into the Weapons room, the other into the Engine room. Not good! As more rebels beamed over to the ship, with my weapons taking more and more damage, I knew I needed to escape immediately. Oh no, they're firing the laser superweapon!!! All or nothing, right here. Let's do it. Praise RNGesus! No damage taken! Admittedly, that was with the full four shield bubbles and 48% evade, but you never know when a bad streak of luck could hit. I used this brief respite to race the two Humans back to the Medbay for healing, as I knew the Mind Control would strike again soon enough. The missiles were also failing to find their mark, as only 1 out of the first 9 actually hit the ship! High evade and the Defensive drone were doing work. I managed to punch through the flagship's Zoltan Shield, land a Hacking drone, and nail the first volley against the rebel shield unit. It was the same 6 hull + system damage, and I heard the telltale sign of a hull breach in there. Excellent! No fast repairs for them. But now the enemy Mind Control was ready again, and this time they tagged the Engi pilot, the worst target. Combined with the loss of Backup Battery power, I started taking real damage again. Two of the next three missiles hit, with one of them landing in the Piloting room and setting it on fire. That was disastrous - a Mind Controlled pilot and the room itself burning. Seriously Engi B? Did we really need more drama at the absolute last moment possible?! The next laser surge hit with the Engi B having all of 15% evade. I expected that we would get wrecked here, but the ship only took 3 points of damage. Not too bad. More missiles landed though, and the hull was down to 8 points remaining. At the same time, I destroyed the remainder of the flagship's shields with another laser volley, leaving the rebels with single-digit health as well. Now it was a pure damage race to see who could finish off their opponent faster. 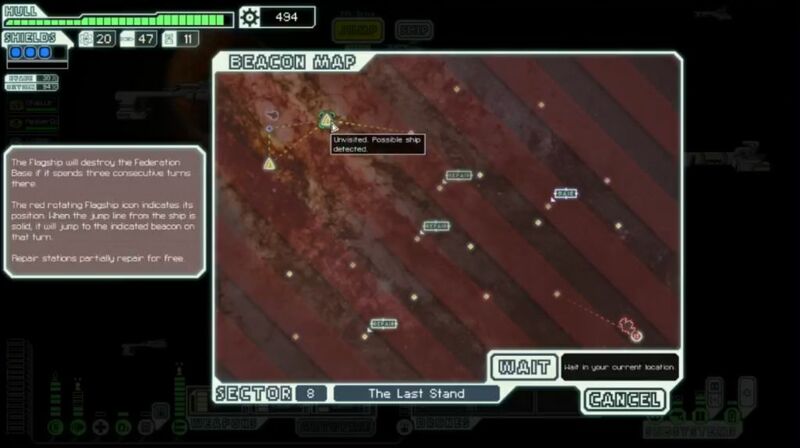 The Livestream chat started going crazy at this point, urging me to use the Hull Laser on the empty rooms of the flagship for the double damage bonus. I was so locked into the combat that I didn't see their messages, causing the chat to get more and more frantic. So close now! Hull breaches everywhere, multiple fires burning throughout the ship, oxygen about to run out - could we get the last shots off in time? Come on!!! YES!!! The rebel flagship finally blew apart in a ball of fiery death. I honestly did not think that the Engi B's hull would hold out long enough for a victory. High evade and some lucky dodging, if not preposterously good fortune, had been enough to win out in the end. The retreating maneuver to kill off the rebel marines had been absolutely necessary to win, even at the cost of 4 damage taken. I had trouble enough just with the Mind Control, let alone enemies on board the ship too. I included the stream chat in this last picture so that you could see what was going on there at the end. I think the viewers nearly had a heart attack as well! I don't know what else to say at this point about the Engi B. It certainly took me on a wild ride in this game. I'm not eager to take on the flagship again with only 3 crew running my ship, but at least I know that it's possible now. Having Cloaking on hand, or even the fourth Human who died in that silly event earlier, would have made this a heck of a lot easier. I doubt it would have been as memorable though. Thanks for reading and watching - and good luck to anyone else who wants to try their hand at this terrible ship!